Mission Statement : Shake A Paw Rescue and Adoption Center : The Shake A Paw Rescue and Adoption Center is a Registered New Jersey Charitable, Non-Profit organization created to provide animal rescue, shelter and adoption services. The Shake A Paw® Center for Rescue and Adoption will provide animal rescue, shelter and adoption services for homeless, abandoned and unwanted dogs and puppies. Our Adoption Center will strive to place all of our homeless dogs in a forever home. We will provide low cost vaccine clinics which will allow all pet owners the ability to keep their pets vaccinated and healthy. 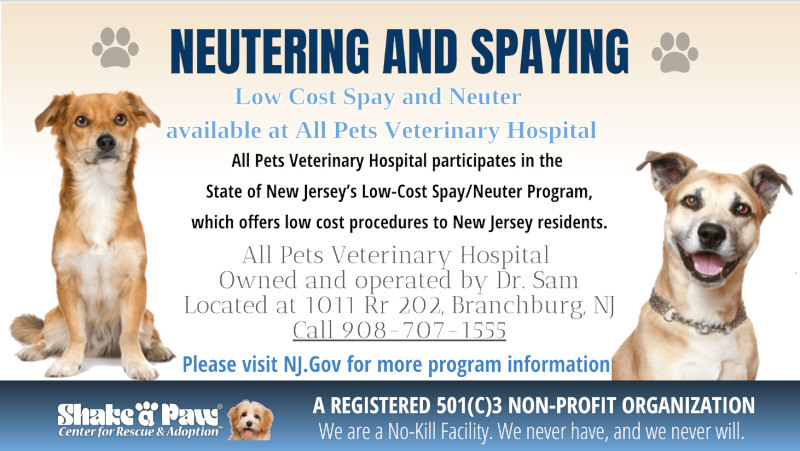 We will encourage responsible pet ownership while reducing pet overpopulation by educating potential adopters about the many benefits of spaying and neutering your new best friend.